Hand it to the Mexicans, Spanish, Europeans, University of Florida and other partners. I think Gran Telescopio Canarias is going to be the largest optical telescope in the world. Inauguration on July 24 2009, just days past the 40Th anniversary of Apollo 11's first moonwalk. Space exploration is still making strides. Continued below. 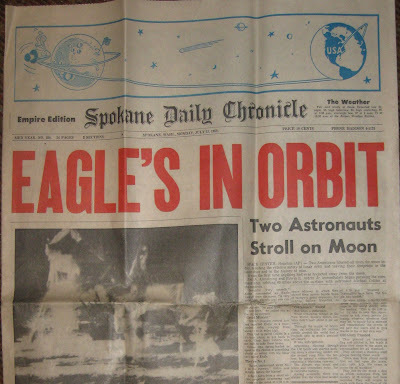 I kept front page of Spokane Chronicle from the day after "that day" in July 1969. Chronicle has not been published for years, long before the current Internet shakeup of newspapers. There was some science aboard that moon mission, but nothing as sophisticated as the science pouring in from today's satellites and observatories. Far from turning our backs on space, the news keeps getting more exciting, at least for those of us who follow it. I remember newscasters talking about 3 experiments that astronauts set up on the moon that day. Maybe there were more, but I remember 3. Mirrors were placed near the lander to reflect lasers beamed up from McDonald Observatory in Austin, TX. It was to measure distance between the Earth and moon within inches. Interesting to measure something that far in mere inches. Quite a feat for those days. Since then, the lasers have been improved for more accurate measurement. Maybe those mirrors are still in use, I'm not sure. They were employed for years after 1969. Astronauts also set up a seismograph on the moon, from what I remember. Or maybe that was later missions? A seismograph to measure moon quakes. Starting to probe the moon's interior. Then there was that sail thing. Not the American flag. It was another "sail thing." Something like tinfoil which was rolled out to catch solar wind; a mystical stream of particles coming out of the sun. Quite exciting for science in those days, but still kind of small compared to discovering planets around other stars in our galaxy; for instance. The science of astronomy keeps getting better as instruments become more precise and "high tech." Amazing discoveries are now being made from telescopes that never even leave the ground. Other observatories are way out in space. Apollo 11 was a great achievement, an engineering feat and a media event. A giant leap and there are still giant leaps being taken today. Yes, it was a great step forward and I was riveted to the television, that day, along with the estimated 300 million (pretty impressive percentage as world population was less in 1969) viewers. It was the summer before my freshman year in high school. Maybe I was riveted too much to the television as just before Niel Armstrong took his steps down that ladder, our TV went dark. It was a flash and then the screen was dead. No sound either. A vacuum tube burned out. I had our TV on all day watching the coverage. The tube just chose that moment to burn out. If your cellphone used vacuum tubes today, it would probably have to be as large as the Saturn 5 rocket which carried those astronauts to the moon. With our set down for the count, the family piled into our Rambler Station waggon and headed to the Stevenson's house and another television. We arrived after the first steps, but still got to see countless reruns. On an interesting note, Stevenson Dorm complex at WSU in Pullman was named for Mrs. Stevenson's husband who had passed away earlier. 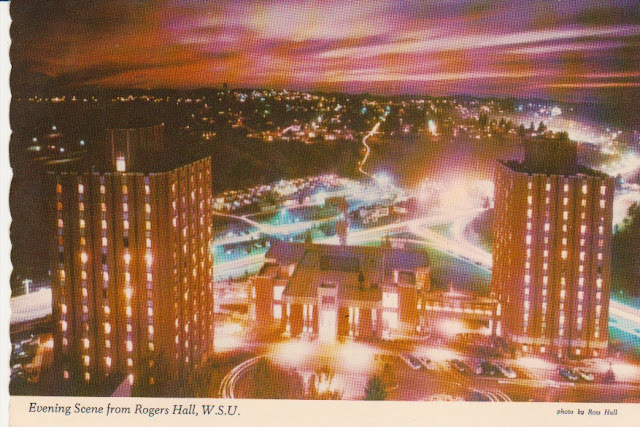 Looking out over Stevenson Complex from an old postcard. I was the only person in my family of 2 parents and 5 kids to agree with the moon landing. Others basically thought it was a waste of money. My two older sisters were planning to drive across the state to Seattle that day. They didn't let the moon landing interfere with their plans. Judith did say she took a picture of the drive-in they stopped at just as the car radio reported Niel Armstrong stepping onto the moon. She captured the moment. I was the only one in my family glued to the television that day. The television gave out (burned out vacuum tube) just before that critical moment, but everyone took it in stride.